If there's one thing I love, it's rose gold. I re pin it, retweet it and love anything that is plated with the stuff. Obsessed? That doesn't quite cover it. Over the past couple of months I have accumulated a large amount of rose gold items and with my collection ever-growing and expanding into interior, I thought I would give you the run down of my favourite items. Urban Decay Naked 3 Eyeshadow Palette | £38 | Link | Whenever I am in doubt there is one palette I always reach for and that's the Naked 3 palette. Renowned for its rose hued neutral shades that suit all skin tones, this really is the palette that people own or need to own. Made up of 3 mattes and 9 shimmer shades, you have all the basics covered and with the weather getting hotter, there's nothing I love more than a pink and copper eye. Charlotte Tilbury Filmstar Bronze and Glow | £49 | Link | This sculpting and highlighting duo has been a part of my daily routine for many months now, adding a touch of colour to the skin without being OTT. Even though I have ventured into other sculpting powders, it doesn't mean I will stop shouting from the rooftops about this one any time soon. Rose gold on the outside, perfection on the inside. Maybelline Colour Tattoo Cream Eyeshadow - Pink Gold | £4.99 | Link | I recently wrote about this shade here, after lusting after it for many, many years. The pink shimmery shade is perfect for when you want a subtle wash of colour on your lids, but it also works great as a base for your eyeshadows too. If you're looking to invest in a range of cream eyeshadows, I would recommend looking into the Maybelline Colour Tattoos first as for £4.99 a pop, they're affordable, high quality and a great addition to any collection. Topshop 5 Years Of Beauty Range | £6 - £9 | Link | *Heart eye emojis*. When this range got released I instantly got the "I need to own everything" feeling. Rose gold packaging and great quality products? Yes please. Innocent is a lipstick shade that I have wanted for ages, highly pigmented and with a cream finish, this formula leaves the lips feeling nourished, whilst not lacking in pigmentation. If you want to try out a new make up range, then you need to head down to your local Topshop and pick a few of their products up. Olivia Burton Scalloped Edge Rose Gold Watch | £95 | Link | I've never been a wrist watch wearer, but after setting my eyes on this watch, I knew I had to have it. The scallop detailing with rose gold hardware is something that anybody would struggle to dislike. For the price I think that this is a high quality watch and a great investment. I cannot wait to pair this with high waisted shorts and a white slouchy t-shirt in the Summer. Zoeva Rose Golden Brush Set | £56.95 | Link | I'm definitely saving the best one for last. 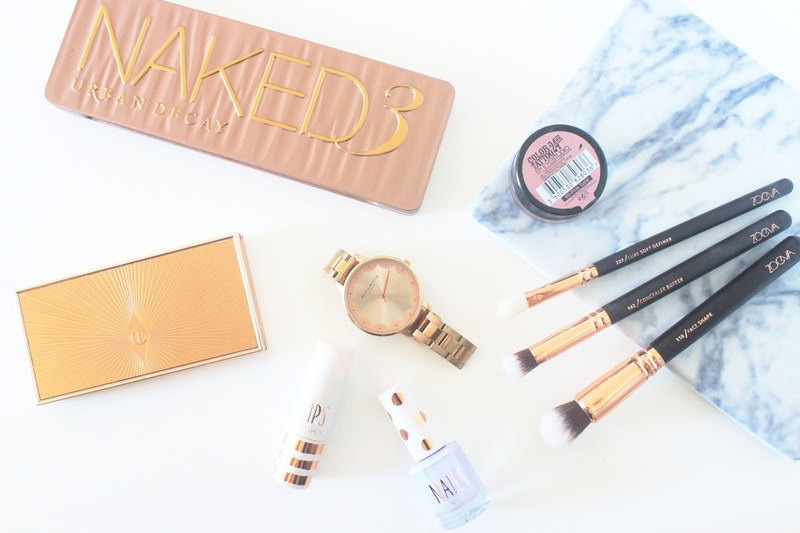 The infamous Zoeva Rose Gold brushes had to get a feature in this post didn't they? The natural and synthetic bristles make them suitable to be used with cream, powder and liquid products. I reach for them daily and I find them very versatile, I would recommend these if you're looking for a do-it-all set of brushes. What are your favourite rose gold products? What do I need to add to my collection?